Now available as hardback or Kindle via Amazon. Digital Technology promised riches for everyone. The reality is enslavement in a 24/7 world of work, with stress for many reaching epidemic levels. Leaders must grasp the challenge to deliver a culture that works for all and follow new digital rules to deliver an engaged and productive workforce. This is the motivation behind “Conquering Digital Overload” a new book written by Future Work Forum Partners. The book has been pulled together by the three Editors, Peter Thomson, Mike Johnson and Michael Devlin, and represents the combined ideas of 16 people, each with their own expert view on the subject. It starts with an overview of the issues from Peter Vogel assisted by Goran Hultin followed by a chapter covering the impact on employees from Richard Savage and Michael Staunton. Then it covers the business issues which are outlined by Alain Haut and Peter Thomson. There are two chapters from Cliff Dennett and Mike Johnson covering the challenges and solutions based on technology. We also have two chapters from Susan Stucky and Jim Ware from the USA, one covering the changing nature of work and the other looking at the mindset shifts needed for the future. The subject of organizational culture is covered in two chapters from Ben Emmens and Peter Thomson, pointing out the challenges and providing some solutions for leaders. The book contains examples and practical advice in chapters on engagement by Matthias Mölleney and Sunnie Groeneveld from Zurich and a chapter on wellbeing and the workplace with contributions from Andrew Chadwick and Larissa Hämisegger. 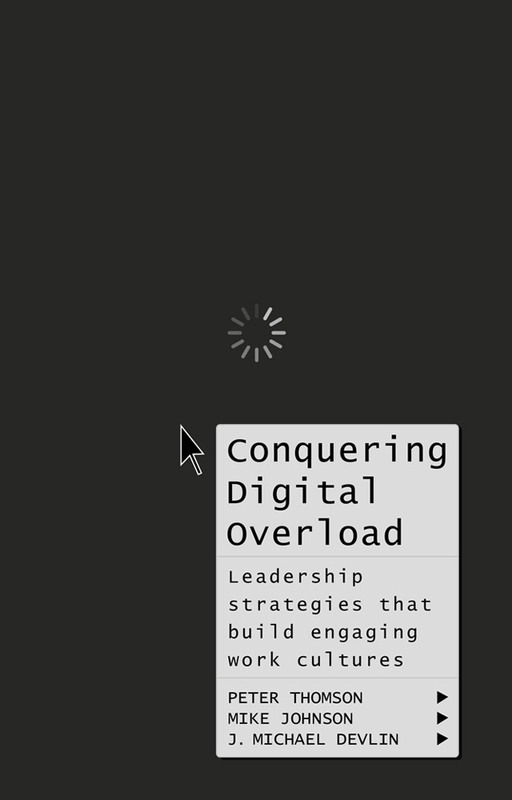 There is also one chapter from Michael Staunton and Michael Devlin specifically on “Actions to mitigate Digital Overload”. Overall this makes a unique collection of ideas, thoughts and tips on the challenges presented by today’s ‘always on’ technology. It provides guidance for leaders and managers and food for thought for anyone concerned about the stresses of the digital age. “This is a very important book that should act as a wake up call to all organizations and individuals about the dangers of digital overload and the need to design working practices that allow us to unplug.” – Prof. Eric Cornuel, Director General and CEO, EFMD.